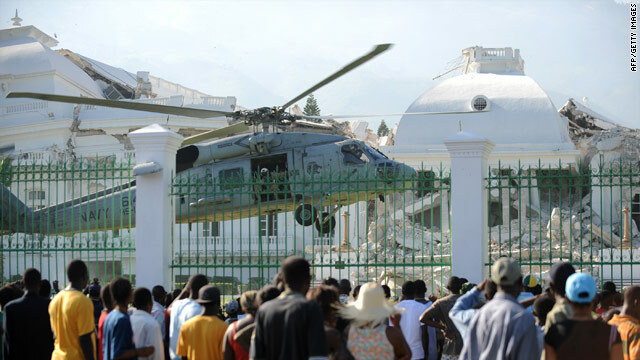 A crowd watches a U.S. Army helicopter land Tuesday on the grounds of Haiti's ruined Presidential Palace. 10:37 p.m. -- Two children were pulled alive Tuesday night from the rubble of a two-story building in Port-au-Prince. The 8-year-old boy and 10-year-old girl, rescued by a team from the New York City fire and police departments, were taken to an Israeli tent hospital. 10:31 p.m. -- Rescue teams on Tuesday stopped searching the rubble of Port-au-Prince's Caribbean Supermarket, where five people were rescued over the weekend. "You have to accept the realization that the potential for survivability is extremely low," said Capt. Joe Zahralban of the South Florida Urban Search and Rescue team. "It gets to a point where you can only risk the rescuers' life so much before you say, we don't think there is anybody left." 10:25 p.m. -- Heavy traffic is making the 200-mile drive from the Dominican capital of Santo Domingo to the Haitian capital of Port-au-Prince take as long as 18 hours, a United Nations situation report says. This is hampering groups' ability to send aid from the Dominican Republic to areas in need in Haiti. 8:53 p.m. -- Although aid organization Doctors Without Borders is "facing huge problems" in receiving supplies, it is doing what it can to get work done, said Renzo Fricke, the group's chief of Haiti operations. "This morning we had to buy a saw in the market, in the city ... for our surgeons to do amputations," he told CNN's Christiane Amanpour on Tuesday. "We had to buy a saw because our materials -- the medical equipment is not coming as it should arrive." Bottlenecks at Port-au-Prince's small airport has been a problem for aid groups since the earthquake; Doctors Without Borders says that five of its supply planes have been diverted from Haiti to the Dominican Republic since January 14. 8:40 p.m. -- Ena Zizi, the woman in her 70s who was rescued from rubble in Port-au-Prince today, has been airlifted by a U.S. Coast Guard helicopter to the USS Bataan, CNN's Ivan Watson reports. Earlier, she was being treated at a clinic, but it didn't have the operating facilities she needed. 8:24 p.m. -- At a candlelight vigil outside the Haitian Embassy in Washington, D.C., Haitian Ambassador Raymond Joseph urges people to donate money for Haiti as opposed to supplies. "It is more cumbersome to transport all these things from here in Washington, D.C., all the way to Port-au-Prince," he said. 7:26 p.m. -- Retired U.S. Army Lt. Gen. Russel Honore, who led relief efforts for Hurricane Katrina in 2005, says "we need to start talking about evacuating the vulnerable population" -- including those who are injured, elderly, pregnant and disabled. "We need to talk about a mass evacuation, and we need to tell the United States military to open two more airports. ... We've got the capability to do it, we need somebody in Washington to wake up and make it happen, and we can't wait for the U.N. to figure out it needs to be done," Honore said on CNN's "The Situation Room." 5:44 p.m. -- Doctors at a makeshift, outdoor hospital in Jacmel, Haiti, say they need more specialists, including orthopedic doctors and anesthesiologists, CNN's Soledad O'Brien reports. The doctors currently there say they're approaching the limits of what they can do for the 75 patients, some of whom have broken limbs and head injuries that need further treatment. 5:25 p.m. -- The mayor of Washington, D.C., says the city will help the Haitian Embassy there handle the flood of phone calls and donations it has been receiving since the January 12 earthquake in Haiti. Mayor Adrian Fenty says the city is opening a "command center" at the embassy that will add 20 phone lines and laptop computers to assist with communication efforts, CNN's Greg Clary reports. 5:07 p.m. -- Medical personnel treating Ena Zizi, who was rescued today from rubble in Port-au-Prince, say she needs surgery but they don't know where to send her for one, CNN's Anderson Cooper reports. The people at the clinic where she's being treated are trying to find a surgical unit. Zizi, believed to be in her 70s, did not have access to food or water in the seven days since the quake, Cooper reports. 4:36 p.m. -- About 2,000 U.S. troops are in Haiti, and more than 5,000 are just off-shore on U.S. ships, said Maj. Gen. Daniel Allyn, the deputy commander of Joint Task Force Unified Response. He said the U.S. military anticipated eventually having an "aggregate strength" about 10,000 troops. 4:33 p.m. -- Regarding the scores of U.S. soldiers who landed on the grounds of the ruined presidential palace in Port-au-Prince today: Some of them moved to the capital's general hospital, which is without electricity or running water. "Our primary purpose is in getting to the population, whether it be the distribution of water, food, or, in this case, where they've got medical treatment going on and they're overwhelmed," Lt. Gen. P.K. Keen, head of U.S. Southern Command, told CNN at the hospital. He said the troops were providing some security there. 4:11 p.m. -- A clarification on the death toll: At least 72,000 bodies have been recovered since the earthquake, and that doesn't include bodies buried by families or collected by the U.N. peacekeeping mission in Haiti, Haitian Prime Minister Jean-Max Bellerive says. Some death toll estimates range from 100,000 to 150,000 in the capital alone. 3:54 p.m. -- The newly rescued woman, Ena Zizi, said, "Thank God, thank God," after being rescued, CNN's Anderson Cooper reports. She was taken to a nearby medical center in Port-au-Prince. A Mexican search-and-rescue team pulled her from the rubble. 3:08 p.m. -- A woman was rescued Tuesday from rubble at or near the national cathedral in Port-au-Prince, seven days after the earthquake struck, CNN's Anderson Cooper reports. Rescuers believe two other people might be alive in the rubble, Cooper reports. 3:03 p.m. -- Twenty-eight Americans have been confirmed dead in Haiti since last week's earthquake, according to U.S. State Department spokesman P.J. Crowley. "We have an additional number that are presumed dead, but ... we're still looking for specific confirmation," he said. 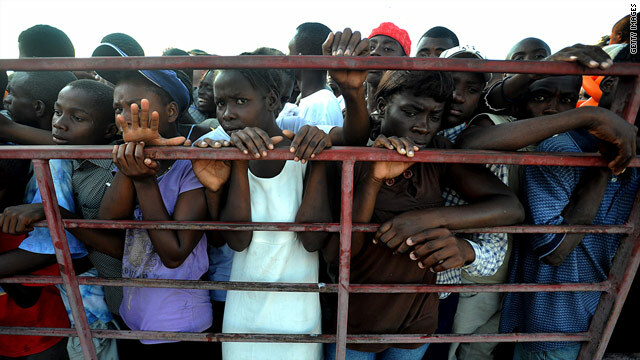 About 4,500 U.S. citizens have been evacuated from Haiti, he said. 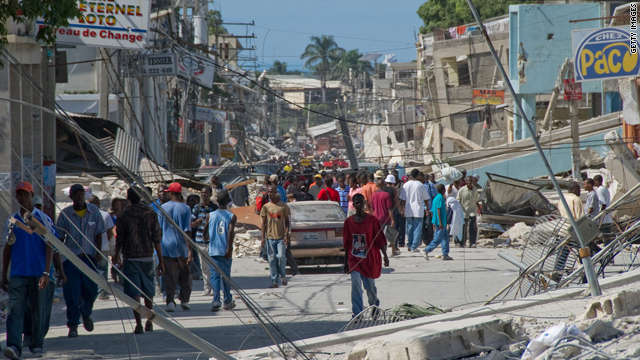 2:58 p.m. -- Haitian authorities have recorded 70,000 deaths since last week's magnitude 7 earthquake outside Port-au-Prince, its prime minister says. 12:53 p.m. -- A 2-year-old girl named Carla opened her eyes Tuesday while being treated at a Cuban-run field hospital after being rescued from rubble on Monday, six days after Haiti's earthquake. 12:50 p.m. -- U.N. Secretary-General Ban Ki-moon said the United Nations Security Council has approved a proposal to send an additional 2,000 soldiers and 1,500 police officers to Haiti. 10:23 a.m. -- Several helicopters from the U.S. Army's 82nd Airborne Division landed Tuesday on the grounds of the ruined presidential palace in Port-au-Prince. It was not immediately clear what their mission was. 9:58 a.m. -- A magnitude 5.8 earthquake struck off the coast of the Cayman Islands, 600 miles west of Haiti, on Tuesday morning, the U.S. Geological Survey reported. There were reports of weak to light shaking on Grand Cayman Island, according to the USGS. 7:36 a.m. -- The American Red Cross and UNICEF's United States Fund raised about $7.3 million in donations from 8 p.m. to midnight, while "Haiti: How You Can Help," a special "Larry King Live," aired on CNN. 7:13 a.m. -- Nearly 500,000 people have encamped in a tent city in the Champs de Mars square in downtown Port-au-Prince, the largest of numerous tent cities scattered throughout the ruined city. 6:02 a.m. -- About 50 orphans who survived last week's earthquake are expected to arrive in Pennsylvania aboard a military transport plane at 9 a.m. ET. In Florida, where evacuees have been ferried in since Saturday, more flights from Haiti are scheduled for Tuesday. Officials at Orlando Sanford International Airport expect arrivals for the next two weeks.